Where could someone who likes to hike, climb, or camp go to college? If you love having an active outdoor lifestyle, you may want to consider our list of 10 Best Value Colleges for hikers, climbers, and campers. Proximity to the most visited national parks that offer tent camping and backcountry camping was one of the ranking criteria. We also considered each school’s net price on College Navigator (listed as in-state where applicable). Closer proximity to national parks and lower net price meant higher ranking. Ties were broken according to lower net price. Schools found within 100 miles of a national park, offering multiple four-year accredited undergraduate programs under $25,000 were considered, but we excluded satellite and virtual campuses. Johnson University is a rural private not-for-profit Christian university a drive away from the most visited National Park in the U.S.
Johnson University is a Christian university accredited by the SACSCC (Southern Association of Colleges and Schools Commission on Colleges). It also has several other accreditation programs and associations. It offers bachelor’s degrees in business administration, communication, English, global community health, history, and human services, to name a few. But perfect for the hiking enthusiast is the sport & fitness leadership degree. Sport and fitness certifications are also available, including the American College of Sports Medicine Certified Health Fitness Specialist [ACSM-HFS] or Personal Trainer [ACSM-CPT] certifications. It ranks on our 10 Best Value Colleges for Hikers, Climbers, and Campers thanks to its reasonable price and relatively short distance from Great Smoky Mountains National Park. In only a 90-minute drive, you can reach the park boasting the title of “most visited National Park.” GSMNP had over 11 million recreational visits in 2016, almost 200,000 tent campers and over 100,000 back country campers! Plus, if you don’t have the time to drive, there is always the Ijams Nature Center Trails with almost 10 miles of multi-use trails. Montana State University offers over 225 academic programs and an affordable degree not far from the world’s first national park. Montana State University is Montana’s largest public university boasting 16,000 students, half of whom are out-of-state. The university offers over 225 academic programs, but majors that may be particularly attractive to the nature-loving include a B.S. in Natural Resources & Rangeland Ecology, specifically a Wildlife Habitat Ecology and Management Option, or an Ecology major with options in Conservation Biology & Ecology or Fish & Wildlife Management. What better way for a hiker to pursue that passion that in a degree that leads to a career working in nature? Plus, the campus is less than two-hour’s drive to Yellowstone National Park. That’s close enough you could make hiking Yellowstone a monthly, or maybe even bi-weekly event! But that’s not all. Gallatin National Forest has 2,200 miles of trails and is 90 minutes away, and then there’s Bridger Mountains located an hour north. Finally, Hyalite Canyon has something for everyone: hiking, camping, and climbing, plus it’s only minutes away from campus. At Hyalite Canyon, you can find both top-roping for beginners and difficult lead routes. It’s no surprise Montana State University made #9 on our list of Best Value Colleges for Hikers, Climbers and Campers. Southern Utah University’s B.S. in Outdoor Recreation in Parks and Tourism is paired with relatively short drives to both Zion National Park and Bryce Canyon National Park. Southern Utah University has more than 140 majors. As a hiking enthusiast, it’s the Outdoor Recreation in Parks and Tourism bachelor’s program that shines through. You can get experience working in the nearby 3 National Forests and 6 National Parks thanks to SUU’s Intergovernmental Internship Cooperative (IIC). You could work with the U.S. Forest Service, the National Park Service, the Bureau of Land Management, or the Paiute tribe. SUU’s high rank comes from its reasonable cost and the fact that it is only an hour’s drive to Zion National Park. In addition, it is surrounded by many other National Parks and National Forests within a few more hours’ distance. When you’re not volunteering in a park, you can get a climbing permit and spend your time tackling Zion National Park’s 2,000-foot sandstone cliffs. But be careful: there are only a few areas for beginner and sport climbers. There is also ample opportunity to do some bouldering and canyoneering. Did we mention that it’s only a 3-hour drive to Grand Canyon National Park? The University of Northern Colorado is a midsize public university only 50 miles from Rocky Mountain National Park. University of Northern Colorado offers 160 undergraduate programs and 120 graduate programs. For a hiker and camper, the highlight would most likely be the B.S. in Recreation, Tourism and Hospitality. With a concentration in Parks and Recreation you can focus on fitness and open space. Or get prepared to work at tourism destinations like national parks with a concentration in Tourism and Hospitality. You can expect to be out doing what you love because you’ll complete a 90-hour practicum as a junior and a 480-hour internship during your senior year. When you’re not completing an internship, you can be hiking to Long’s Peak or even bivouacking to perform some technical climbs. In under an hour and a half’s drive, you have access to 355 miles of hiking trails and its five campgrounds. You can be sure that camping in the wilderness of Rocky Mountain National Park will be an experience that’s sure to please. After all, RMNP had over 45,000 backcountry campers in 2016! Thanks to UNC being one of Colorado’s most affordable colleges and its close proximity to hiking, camping, and climbing in Rocky Mountain National Park, it’s no wonder that it ranks on our 10 Best Value Colleges for hikers, climbers, and campers. 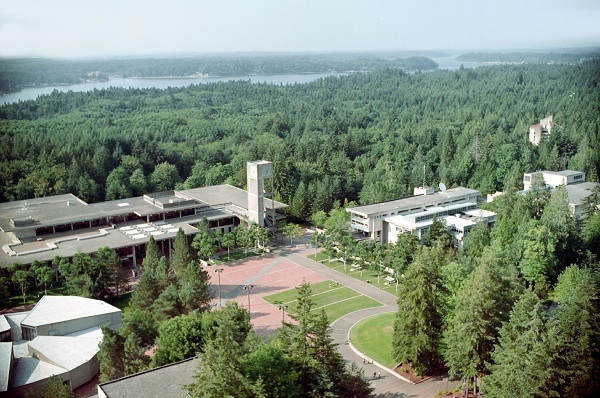 Evergreen State College is a mid-size public university that offers 60 fields of study in an alternative format that promotes integration of different subjects. Evergreen State College offers bachelor of arts, bachelor of science, and bachelor of arts & science degrees in an alternative format: there are no majors! You choose an area of emphasis. If you intend to get a bachelor of arts degree, there aren’t any specific prerequisite classes or general education requirements. The BS and BAS degrees, however, do have minimum science credit requirements. Either way, you’ll take a full course load in a single academic program, which may last two or three quarters. In this program, a team of faculty members from different subject areas will teach you. At a reasonable price, you can choose to study outdoor leadership and education or environmental studies. And you can do it while exploring the city of Olympia’s 900 acres of park land. The campus itself is only a walk away from 3,000 feet of beach on Puget Sound. You can drive to Olympic National Park in an hour and a half and relax or do your studying in the Hoh, Queets, or Quinault Rainforests! Olympic National Park had 100,000 backcountry campers and over 130,000 tent campers in 2016. It also offers trails along the coast, in the valleys, or through the mountains for a diverse mix of breathtaking views. Northern Arizona University is a public university with 150 bachelor degree offerings, only 75 minutes from Grand Canyon National Park. Northern Arizona University is a reasonably priced public university near the Grand Canyon. The Grand Canyon is one of the greatest sites in America and a UNESCO World Heritage Site. Grand Canyon National Park had almost 6 million visitors, 200,000 tent campers and over 300,000 backcountry campers in 2016. Plus, Coconino National Forest surrounds Northern Arizona University. In Coconino, there are a dozen campgrounds and an array of hikes in the Flagstaff Ranger district alone. Coconino has an area for bouldering and a sport climbing area. During your time on campus, you can take advantage of the 38-foot climbing wall. It has ten ropes and a bouldering cave. Climbing programs for beginner to advanced are offered, with free Top Rope Belay clinics. Plus, incoming freshman can take part in the Wilderness Welcome in August before school starts. It’s a 2-credit course with other new students where you go backpacking, rock climbing or hiking. If you’re interested in pursuing a career with state departments of forestry or state land departments, NAU offers a bachelor of science in forestry which is accredited by the Society of American Foresters. University of California-Merced offers the resources of a large, state university in a small, rural campus outside of the majestic views of Yosemite National Park. At University of California-Merced you can access the quality education offered by the University of California. Plus, you’re only a 90-minute drive from Yosemite National Park. Out of the 23 majors offered at this campus, the B.S. in Earth Systems Science may be the fit for science-oriented hikers. Between your studies you can join the 5 million visitors to Yosemite National Park in enjoying a spectacular corner of the country. In 2016 it had over 200,000 backcountry campers and almost half a million tent campers. There is something for every outdoor adventurer. Yosemite has over 750 miles for hikers, 13 campgrounds, and a variety of climbs, including Merced River Canyon. Put your degree to use with a summer job, research experience, or internship in the Yosemite Leadership Program, or other partnerships that UC-Merced has with Yosemite and Sequoia & Kings Canyon National Parks. Plus, some of your classes might take place at the nearby Merced Vernal Pools and Grasslands Reserve. Finally, as a new student, don’t miss taking advantage of the Week of Wilderness, when new students (both freshman and transfers!) are given the chance to explore the wilderness and build a community of friends. Take part in other programs led by the Outdoor Experience Program like custom trip planning and Outdoor Adventure trips. Western Carolina University’s B.S. in Parks and Recreation Management and over 6 miles of trail right on campus make for an incredible outdoor college experience. Western Carolina University is only a 40-minute drive from Great Smoky Mountains National Park. It sits in the rural mountains by Nantahala National Forest. WCU is also under a 2-hour drive from Pisgah National Forest. It offers over 115 undergraduate majors and concentrations, including a B.S. in Parks and Recreation Management. The Parks and Recreation Management program prepares students for a variety of careers. These include: recreation coordinators at resorts, facility managers for military or college campus recreation, and program leaders for city parks and recreation. You’ll also learn the skills necessary to work in the National Parks and U.S. Forest Service. There are internships available to you at places like Great Smoky Mountains National Park and the Blue Ridge Parkway. When you’re not busy studying or working in an internship, you can join in the programs offered by Base Camp Cullowhee, WCU’s outdoor program. It offers the tallest collegiate climbing wall in North Carolina, roll clinics, and reduced-price trips. Plus, with over 6 miles of single-track trail right on campus, you won’t be bored or out of shape during your college years. Plus, as a new student, you won’t want to miss participating in First Ascent, WCU’s Wilderness Orientation program. There you can get to know your classmates, make new friends, and explore the wilderness around campus. California State University-San Bernardino offers an outstanding degree at an outstandingly low cost. The combination of California State University-San Bernardino’s extremely low average net price and its close proximity to Joshua Tree National Park secure second place in our ranking of 10 Best Value Colleges for Hikers, Climbers, and Campers. There are over 70 traditional baccalaureate and master’s degree programs. The BA in Environmental Studies has two track options: a multi-disciplinary track or a science-intensive one. The Department of Geography and Environmental Studies even runs field trips to places like Death Valley. It’s only an hour and a half drive to Joshua Tree National Park, which attracts boulderers, highliners, and climbers from around the world. There are more than 8,000 climbing routes and 2,000 boulder problems for beginners to advanced climbers. If you can’t make it out to the park every day, visit the Student Fitness and Recreation Center. There’s a 34′ high, 1,000 square foot climbing wall, climbing programs, and classes. If you don’t have a car, you can also participate in the CSUSB Outdoors program. This is open to all CSUSB students and provides transportation, food and gear to planned excursions including hikes, backpacking, and overnight camping. Not to mention, California State University-San Bernardino sits in the shadow of San Bernadino National Forest. You’ll find trails for day hiking and overnight trips on the Pacific Crest Trail. Brigham Young University-Idaho offers a recreation management major perfect for hikers, climbers, and campers, not far from the majestic views of both Yellowstone National Park and Grand Teton National Park, and all with a low price tag. It’s no surprise that Brigham Young University-Idaho places first on our list. It combines outstanding value and over 100 bachelor degree options in a locale where hikers, campers, and climbers will thrive. Plus, Brigham Young University’s bachelor’s in recreational management will prepare you to continue doing what you love as a professional career. You’ll never have to “work” a day in your life. Classes in the recreational management major include: Traditional Camping, Rock Climbing, and Canyoneering! Put your new skills to use by driving an hour and a half to Yellowstone National Park. There you’ll explore 900 miles of hiking trails or Grand Teton National Park’s 230 miles of trails. As a major in Recreation Management you can participate in the “Semester @ Badger” during your winter semester. This is a “program designed to create deeply significant leadership, learning, and recreational experiences.” If you’re passionate about using the outdoors to help others, you can choose a concentration in recreation therapy. Certified Therapeutic Recreation Specialists serve those with special needs, at-risk youth, or senior citizens in a wide variety of programs and settings. This concludes our ranking of the 10 Best Value Colleges for Hikers, Climbers, and Campers.